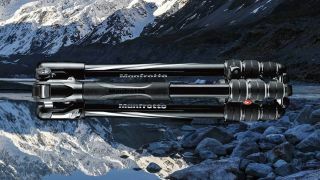 Manfrotto has extended its range of entry-level Befree tripods with three new models. The highlight of the announcements is the Befree Advanced Carbon Fiber. This 4-section tripod features Manfrotto's M-lock twist locks, designed to make setting up and collapsing your tripod quick and easy, while there are protruding parts, making it easier to stow and carry. The Befree Advanced Carbon Fiber comes complete with a 494 aluminum center ball head (MH494-BH) and can support kit weighing up to 8kg / 17.6lb, while the tripod itself weighs in at a very respectable 1.25kg / 44oz. Next up is the Befree GT model. This 4-section tripod is aluminum rather than carbon fiber, but it does fold down to a very compact 43cm / 17 inches, and can support a pretty hefty camera/lens combo of up to 10kg / 22lb. This is thanks in part to the slightly larger 496 aluminum center ball head (MH496-BH), though the payoff is a slightly heavier tripod compared to the Befree Advanced Carbon Fiber, at 1.8kg / 65oz. Manfrotto hasn't forgotten about videographers who like to travel, with the launch of the Befree Live Carbon Fiber. Like the Befree Advanced Carbon Fiber, it features a 4-section tripod design with Manfrotto's M-Lock locking system, but the Live model gains a leveling column and a fluid head (MVH400AH). It promises to be easy to use and set up, with the head featuring two on/off knobs that lock and unlock the head’s pan and tilt movements separately. The Befree Live Carbon Fiber weighs in at 1.38kg / 48.6oz and can support a weight of 3.99kg / 8.8lb. Available later this month, the Befree Live Carbon Fiber will be priced at $349.99 / £349.95, while the Befree Advanced Carbon Fiber will be priced at $319.99 / £319.95 and the Befree GT $239.99 / £239.95. Australian pricing to be confirmed.